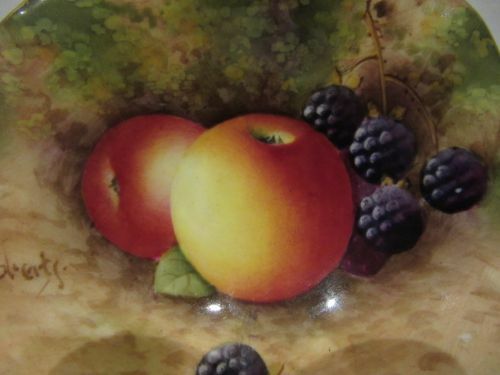 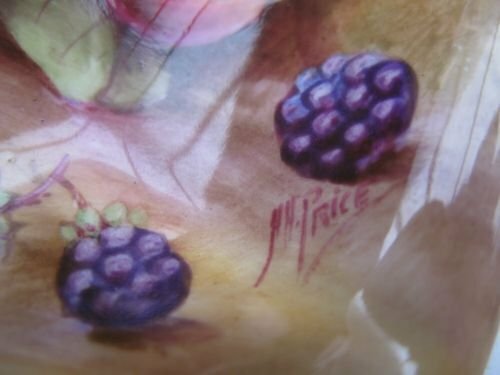 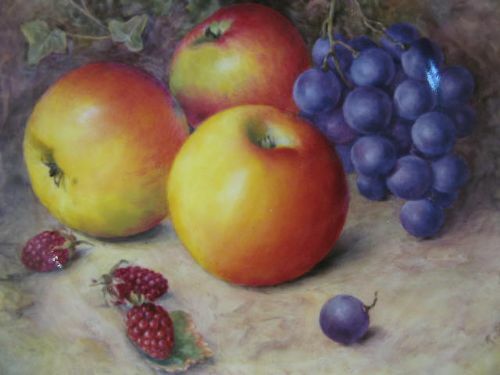 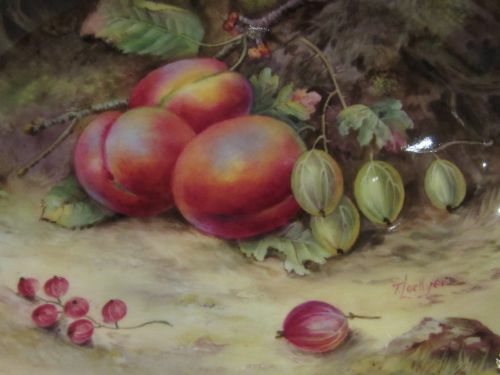 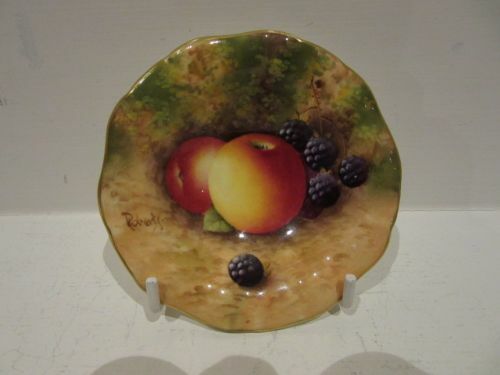 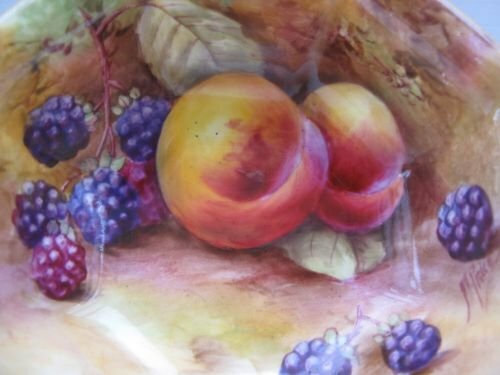 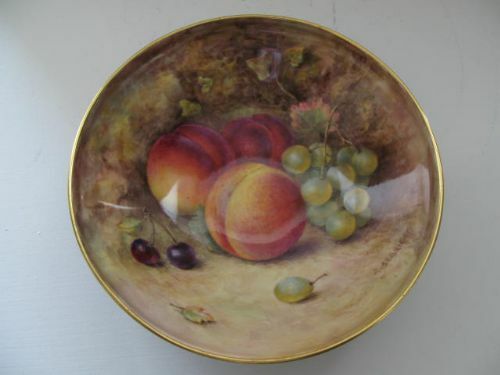 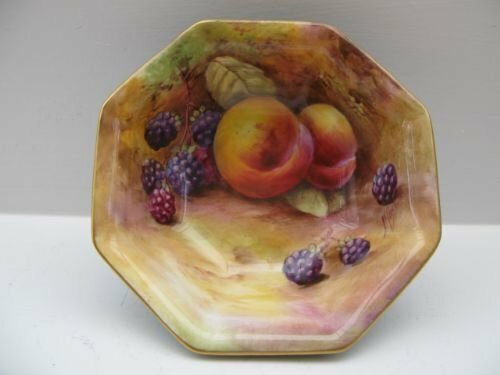 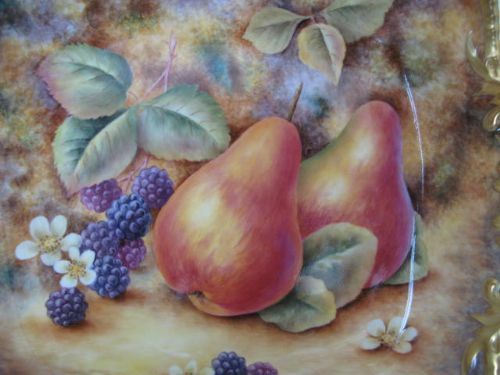 A Royal Worcester Fruit Painted Dish By Horace Price. 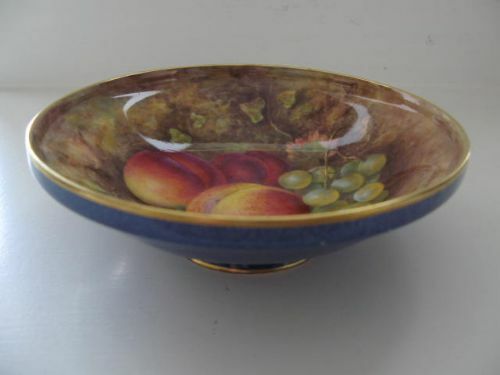 An attractive, Royal Worcester octagonal dish with mottled blue ground decoration to the exterior, and well painted fruit decoration to the interior by Horace Price. 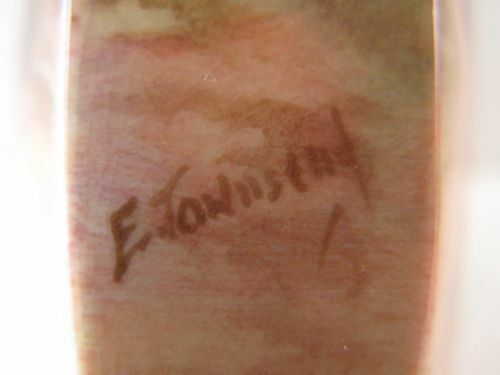 Standing approximately 4.1/4" wide x 1.3/4"deep, it has the puce factory stamp for 1929 and is in excellent condition with no damage, crazing or restoration, and the gilding shows virtually no wear. 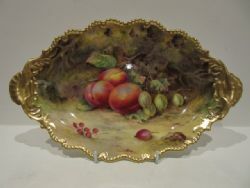 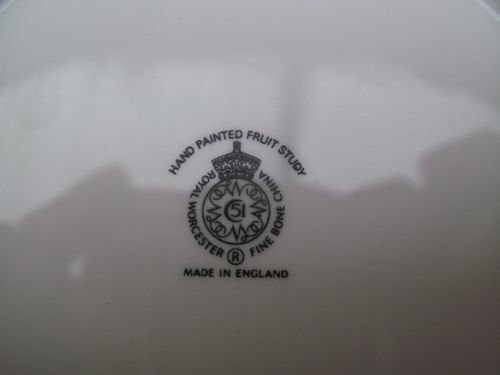 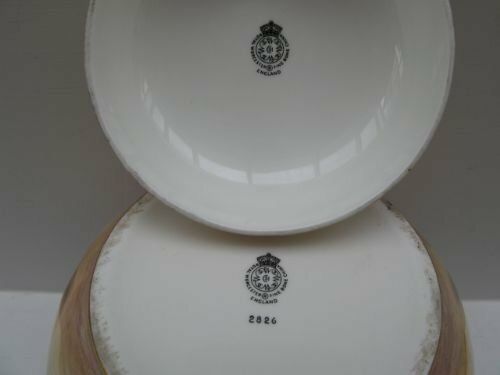 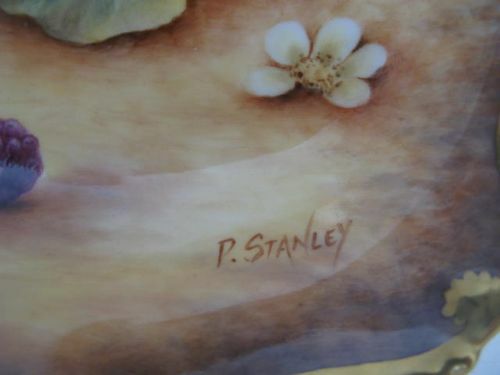 A Royal Worcester Fruit Painted Dish By P Stanley. 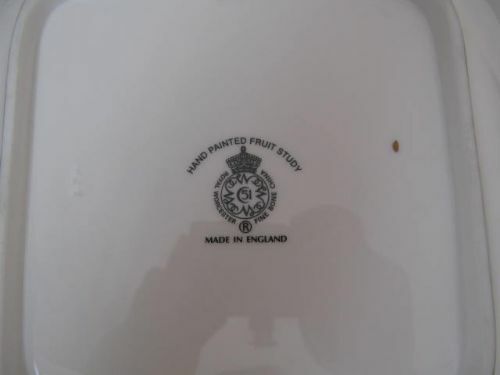 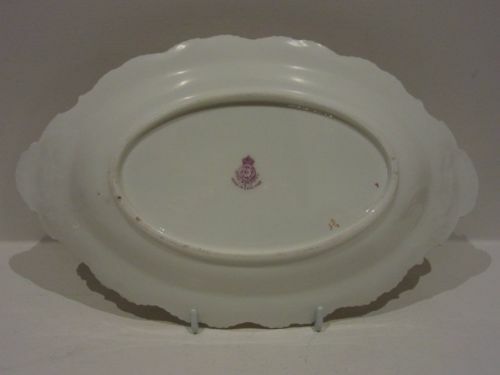 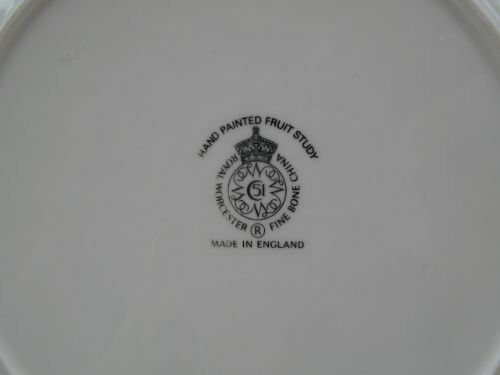 A Royal Worcester porcelain "Tudor" dish, with painted fruit decoration by Paul Stanley. 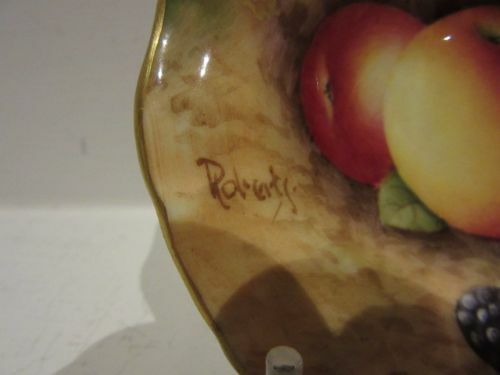 Measuring approximately 11.1/4"long x 9"wide x 2"deep, it has the black factory stamp for circa 1985 and is in excellent condition with no damage, crazing or restoration and the gilding is pristine. 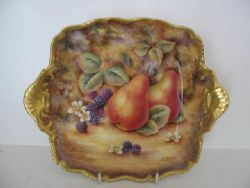 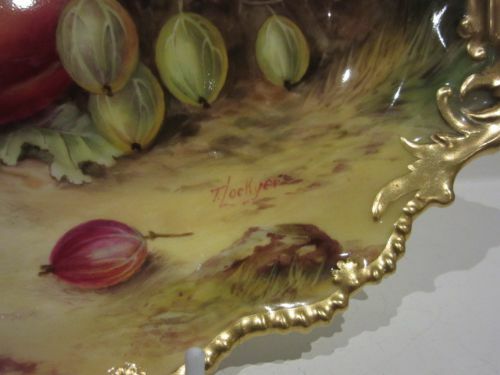 A Royal Worcester Fruit Painted Dish By T. Lockyer. 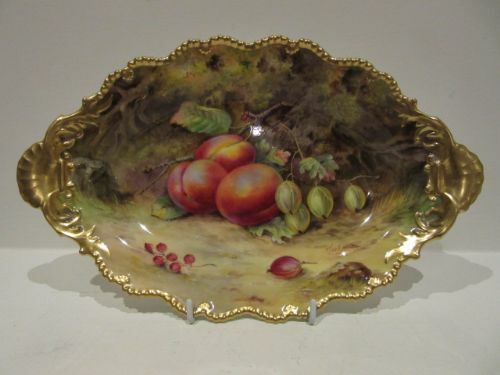 A good Royal Worcester porcelain oval dish, with heavily gilded, shaped rim and decorated with well painted plums, gooseberries and redcurrants against a mossy background by Thomas Lockyer. 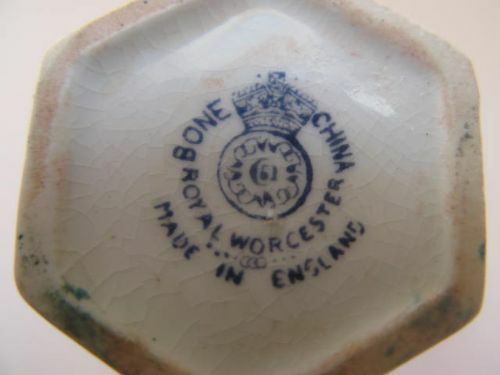 Measuring approximately 12.1/4"long x 7.1/2"wide x 1.1/2"deep, it has the puce factory stamp for 1922 and is in very good condition with no damage, crazing or restoration and the gilding is bright and shows just the slightest of wear to the high points. 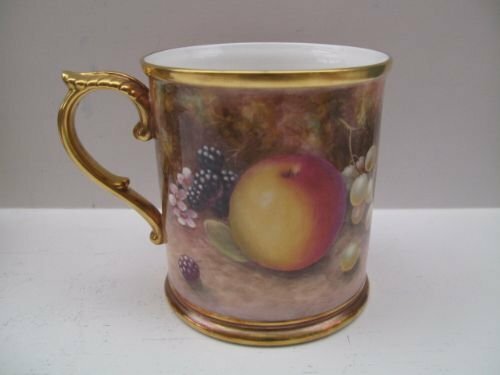 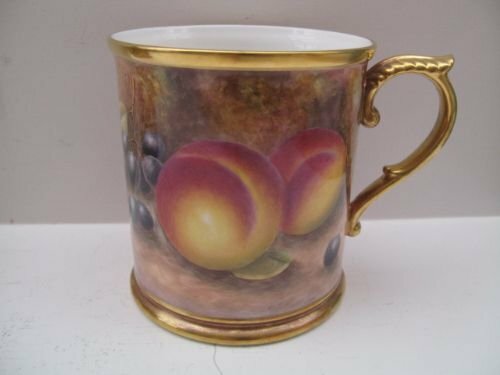 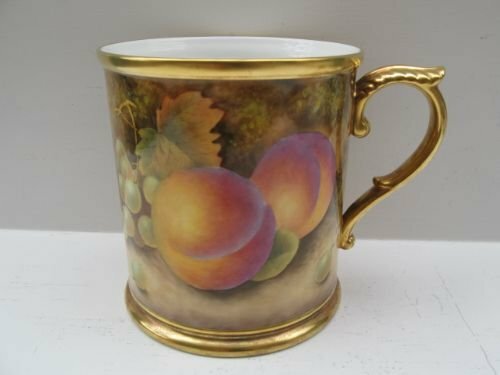 A Royal Worcester Fruit Painted Drinking Mug By M. Morris. A handsome, Royal Worcester 1 pint+ capacity drinking mug, with all around fruit painted decoration by Michael Morris. 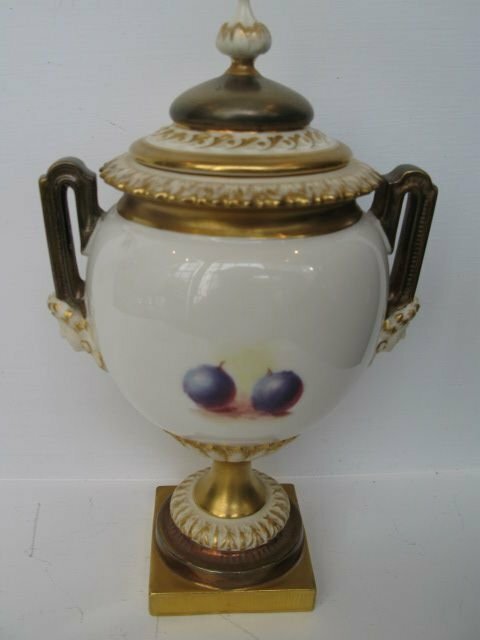 Standing approximately 4.3/4"tall x 4.1/2"diameter and being 6" overall width including the handle, it has the black factory stamp for the last quarter of the 20th century and is in excellent condition with no damage, crazing or restoration, and the gilding is unworn. 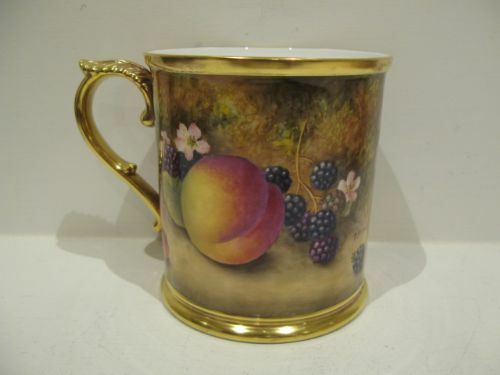 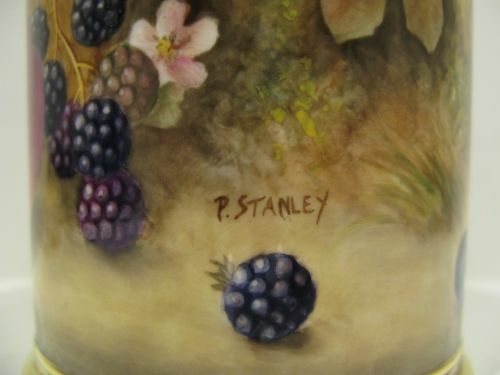 A Royal Worcester Fruit Painted Drinking Mug By P. Stanley. 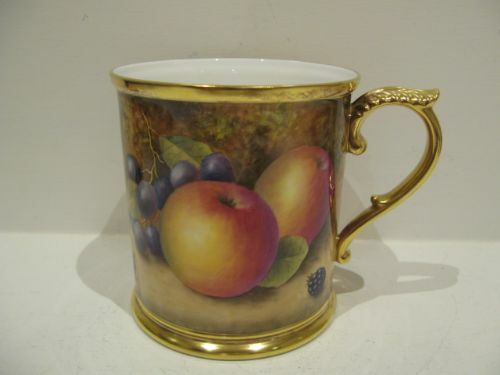 A handsome, Royal Worcester 1pint+ capacity drinking mug, with all around fruit painted decoration by Paul Stanley. 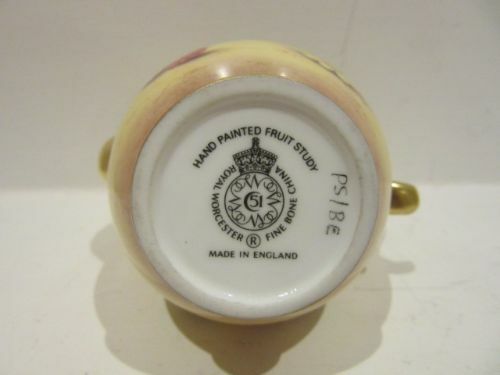 Standiing approximately 4.3/4"tall x 4.1/2"diameter and being 6" overall width including the handle, it has the black factory stamp for the last quarter of the 20th century and is in excellent condition with no damage, crazing or restoration, and the gilding is unworn. 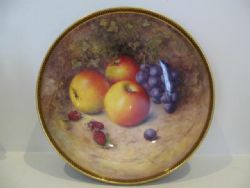 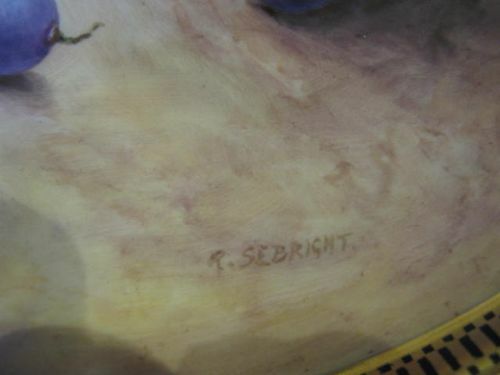 A Royal Worcester Fruit Painted Flower Bowl By R. Sebright. 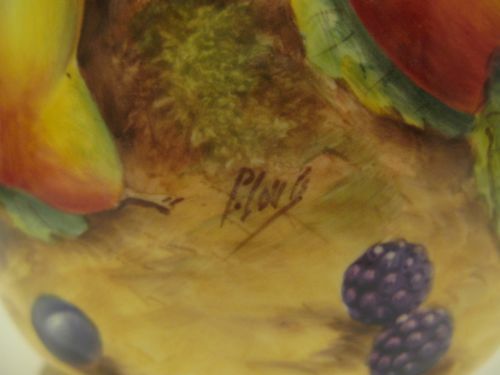 A Royal Worcester porcelain flower bowl, shape number 2769, with superbly painted fruit decoration by Richard Sebright. 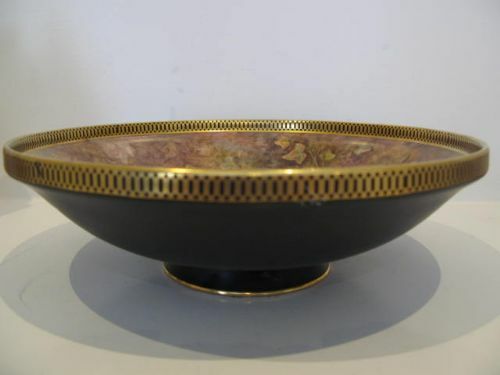 Standing approximately 10.1/4"diameter x 3"deep, it has the puce factory stamp for 1940 and is in excellent condition with no damage, crazing or restoration and the gilding is bright and without wear. 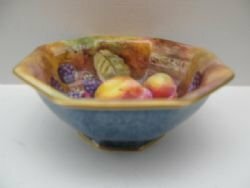 An attractive, Royal Worcester porcelain flower bowl, shape number 2769, the exterior decorated in mottled blue and the interior with beautifully painted fruit and foliage by Richard Sebright, who is ranked as one of the finest fruit painters of any period. 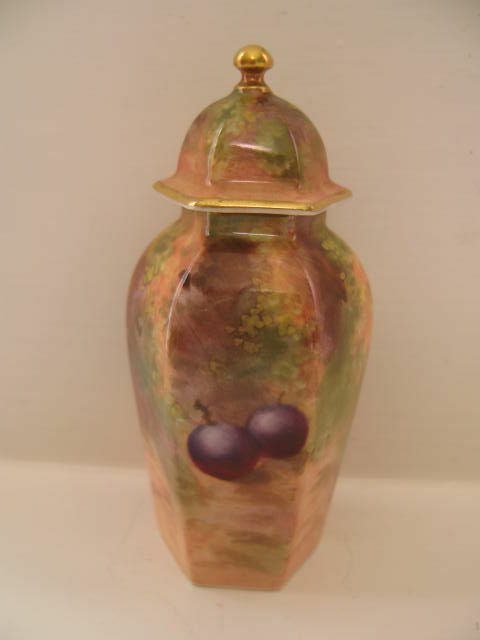 Standing approximately 6.1/4"diameter x 2"tall, it has the puce factory stamp for 1941 and is in excellent condition with no damage, crazing or restoration, and the gilding is without losses or wear. 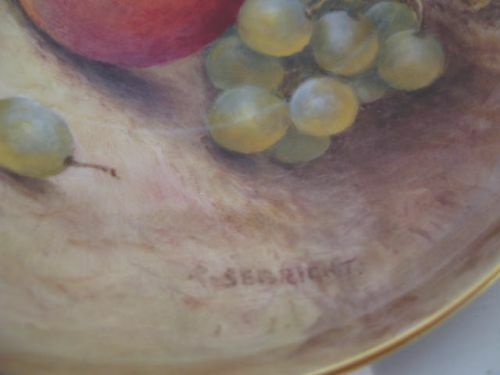 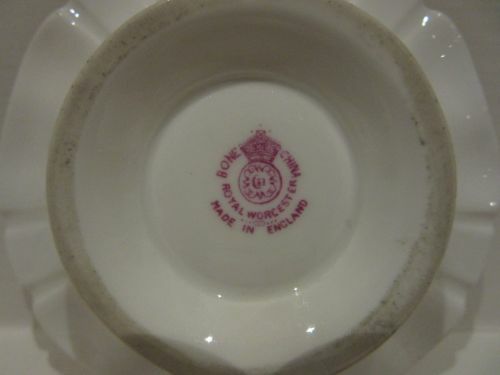 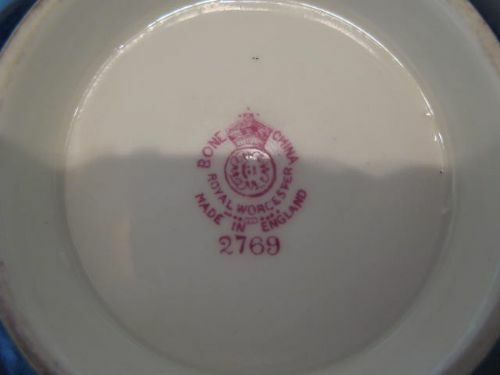 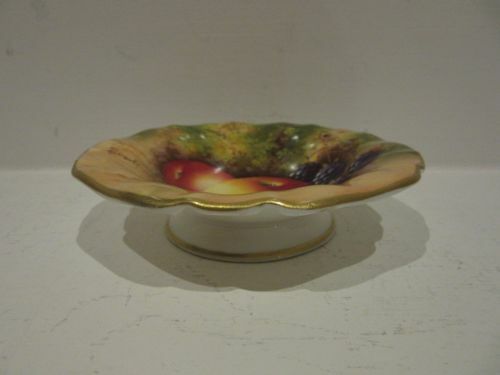 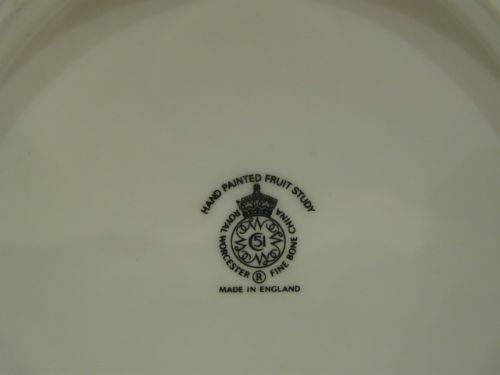 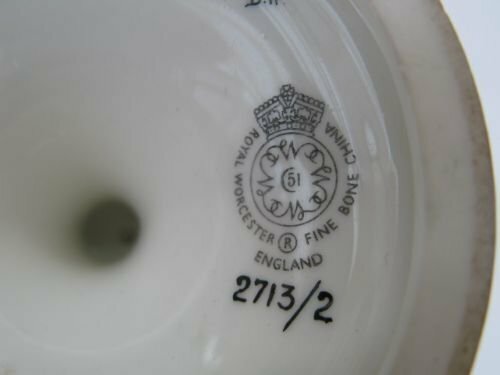 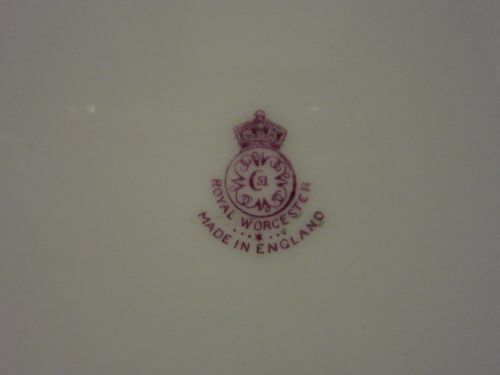 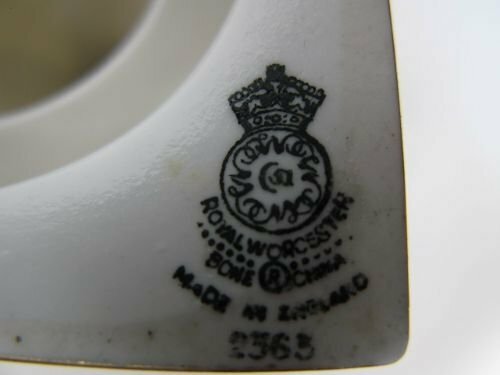 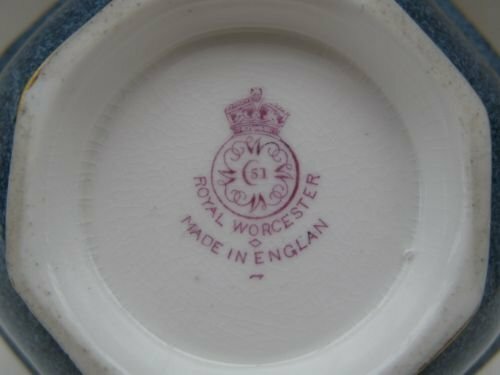 A Royal Worcester Fruit Painted Footed Dish By Roberts. 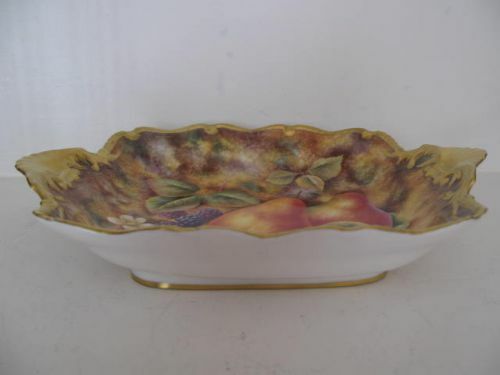 An attractive Royal Worcester porcelain small dish on foot with shaped, gilded rim and well painted apple and bramble decoration by William Roberts. Measuring approximately 3.3/4"diameter x 7/8"high, it has the puce factory stamp for 1938 and is in very good condition with no damage, crazing or restoration and the gilding is bright and shows virtually no signs of wear. 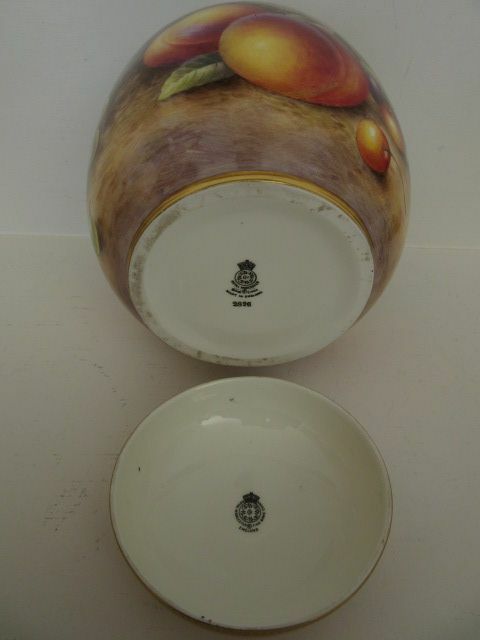 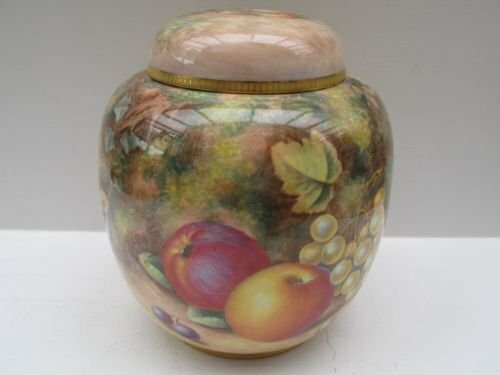 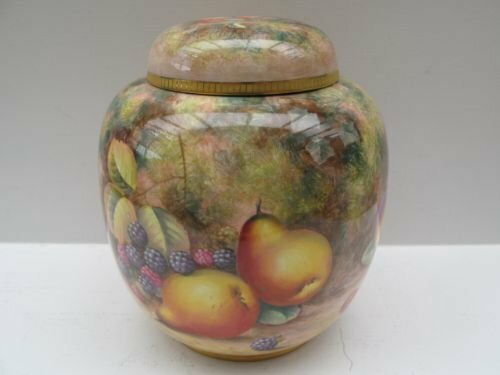 A Royal Worcester Fruit Painted Ginger Jar And Cover By H Ayrton. A Royal Worcester porcelain ginger jar and cover, with well painted all around fruit decoration against a mossy background by Harry Ayrton. 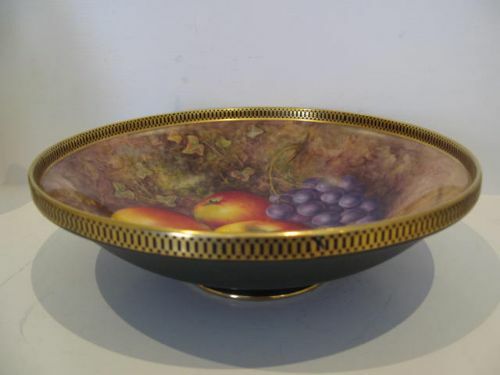 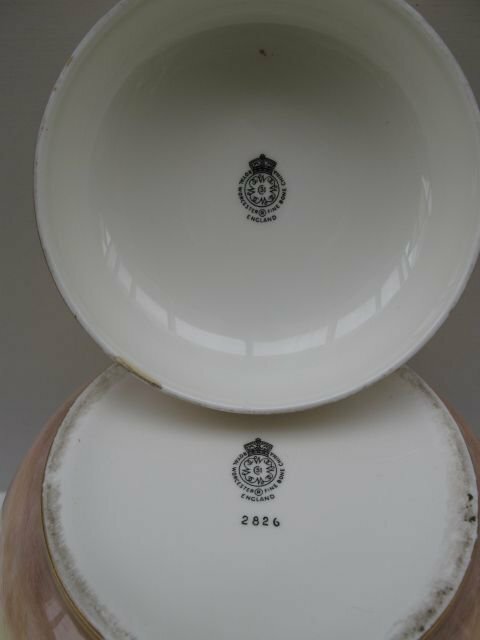 Measuring approximately 6.1/4"diameter x 7"overall height, it has the black factory stamp for circa 1958 and is in very good condition with no damage, crazing or restoration, and apart from a little wear where the lid sits, the gilding is clean and bright. 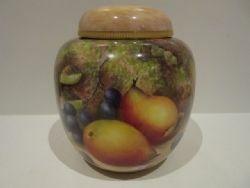 A Royal Worcester Fruit Painted Ginger Jar By H. Ayrton. 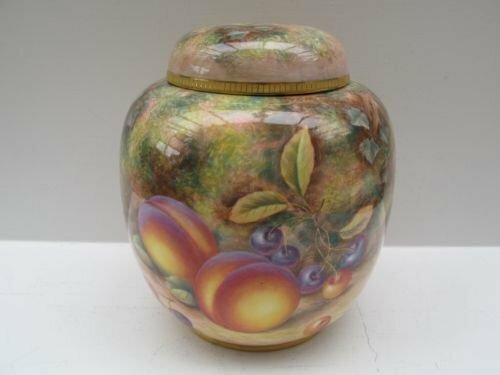 A good quality, Royal Worcester porcelain lidded ginger jar, shape number 2826, with well painted all around fruit decoration by Harry Ayrton. 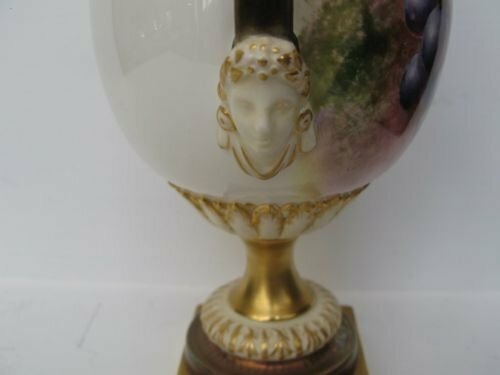 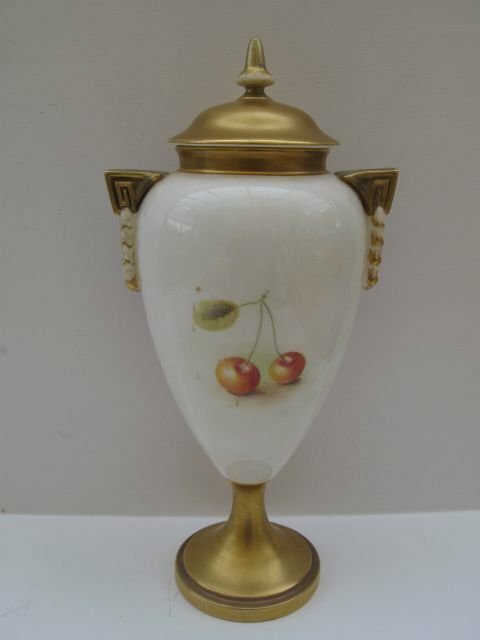 Standing approximately 7"tall x 6.1/2"diameter, it has the black factory stamp to both the vase and lid for circa 1970 and is in excellent condition with no damage, crazing or restoration, and the gilding is fresh and unworn. 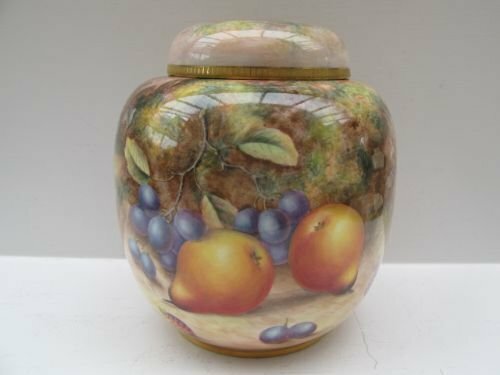 A good quality, Royal Worcester porcelain lidded ginger jar, shape number 2826, with well painted all around fruit decoration by Harry Ayrton. 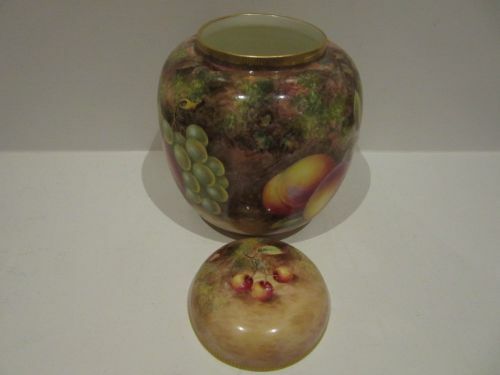 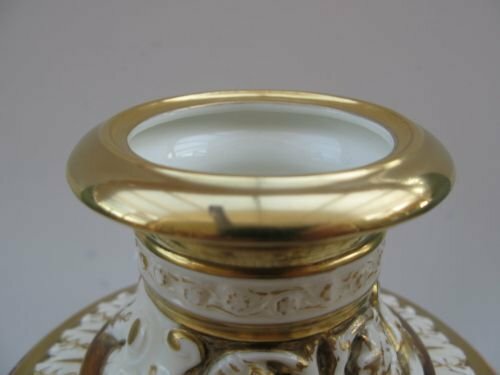 Standing approximately 7"tall x 6.1/2"diameter, it has the black factory stamp to both the vase and lid for circa 1970, and apart from a 1/2" long section of the gilding to the rim of the lid which has been rubbed as can be seen in picture 2, it is in very good condition with no damage, crazing or restoration. 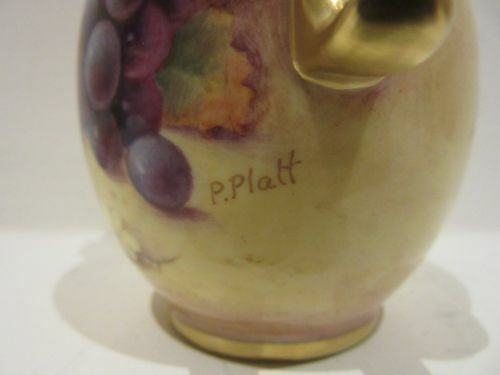 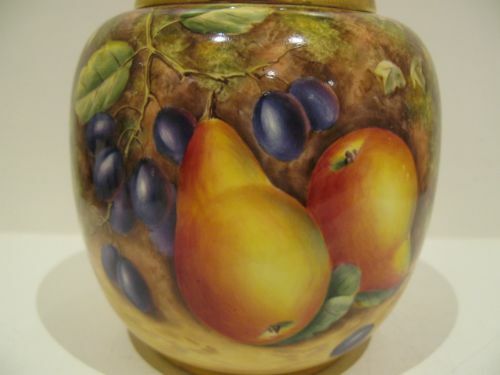 A Royal Worcester Fruit Painted Ginger Jar By P. Love. 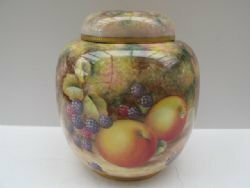 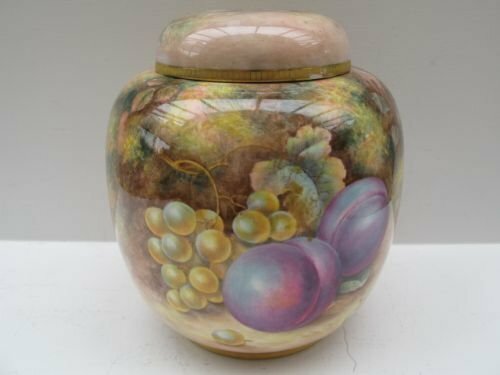 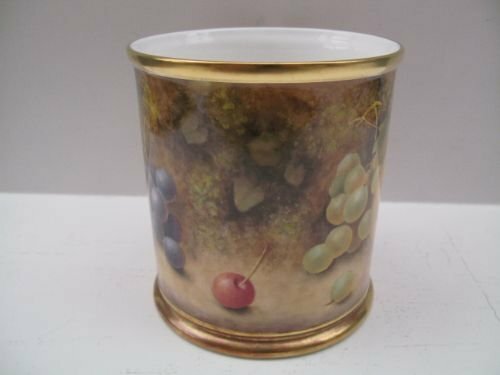 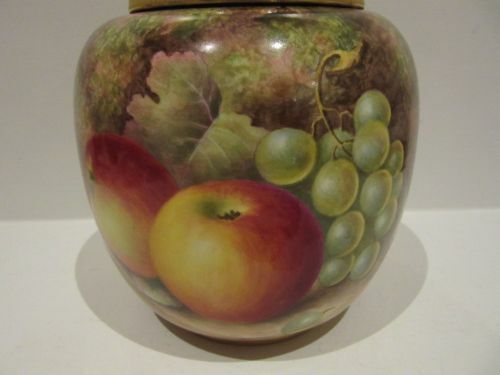 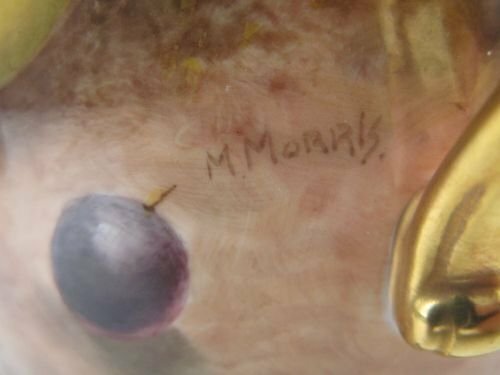 A fine, Royal Worcester porcelain ginger jar and cover with excellently painted all around fruit decoration consisting of 3 distinct studies; apples and brambles, green grapes and peaches, black grapes and pears by Peter Love. 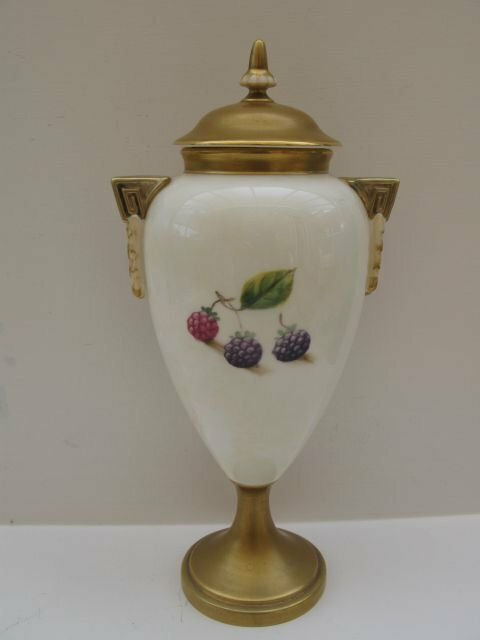 Standing approximately 7"tall x 6.1/2"diameter, it has the black factory stamp to both the jar and the cover for 1960, and is in superb condition with no damage, crazing or restoration and the gilding is bright and without wear or losses. 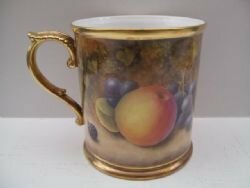 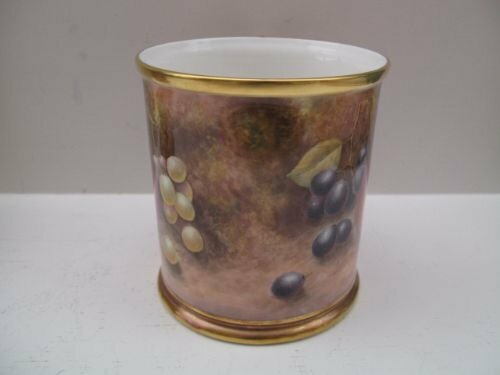 A Royal Worcester Fruit Painted Large Mug By P Stanley. 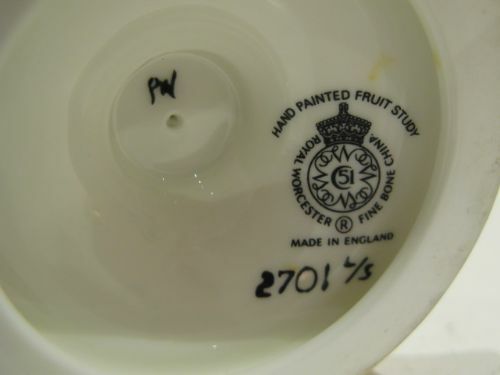 A Royal Worcester porcelain 1 pint mug, with well painted all around fruit decoration by Paul Stanley. 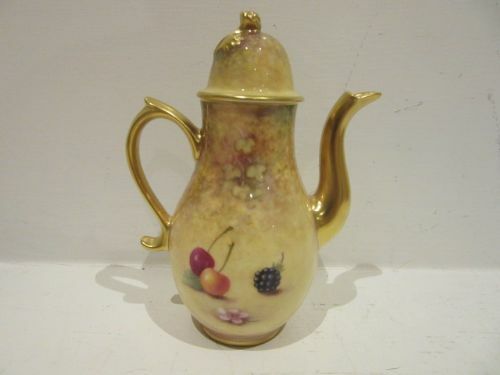 Standing approximately 4.3/4"tall x 5.3/4"wide over the handle, it has the black factory stamp for the last quarter of the 20th century and is in excellent condition with no damage, crazing or restoration and the gilding is virtually without wear. 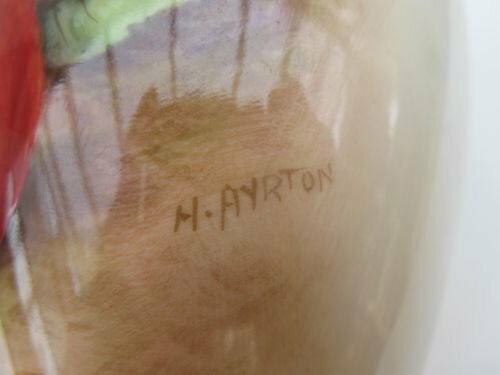 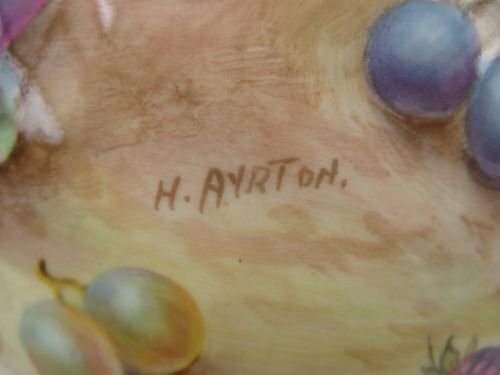 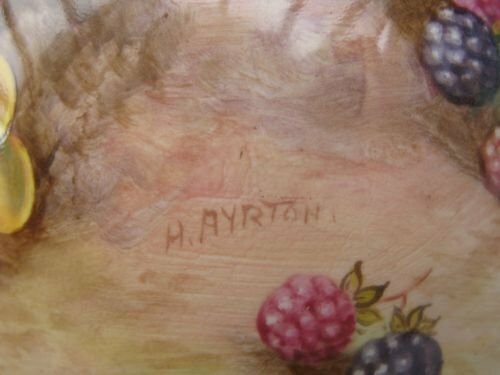 A Royal Worcester Fruit Painted Lidded Vase By Ayrton. 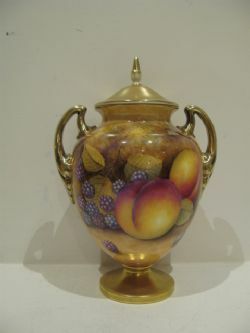 A Royal Worcester porcelain lidded vase, shape number 2713/2, with well painted fruit decoration by Harry Ayrton. 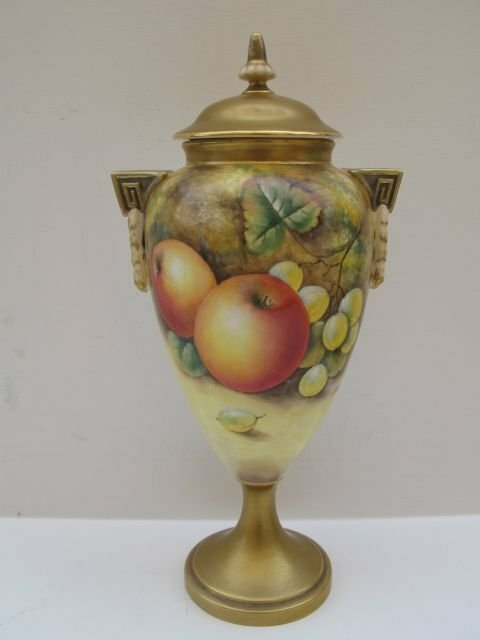 Standing approximately 10" overall height x 4.3/4"wide across the handles, it has the black factory stamp for circa 1970 and is in very good condition with no damage, crazing or restoration, and the gilding is without rubbing or wear. 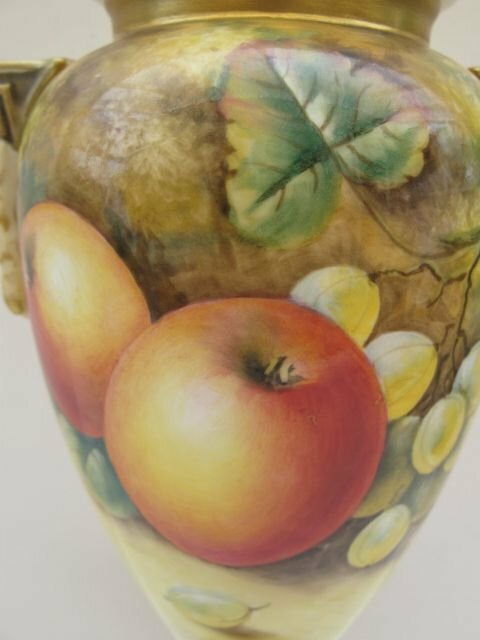 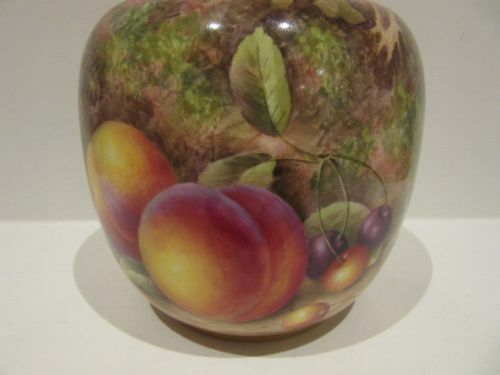 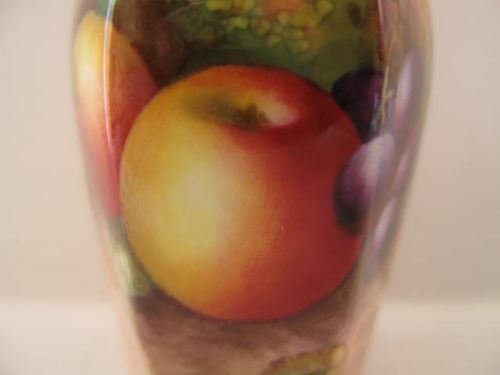 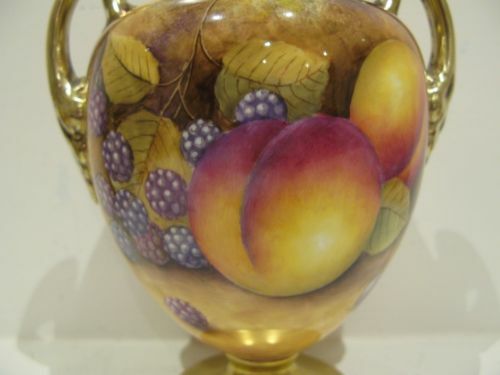 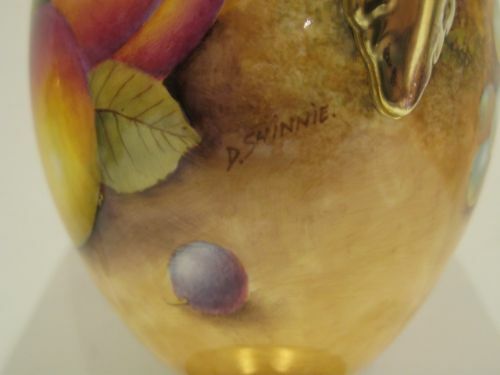 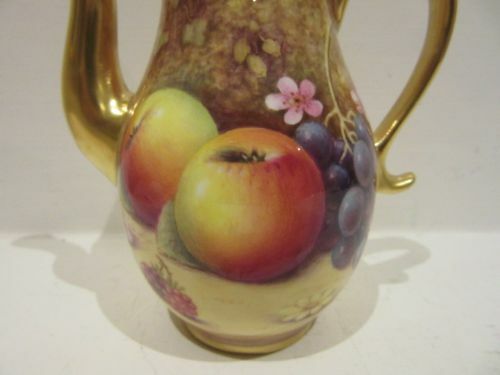 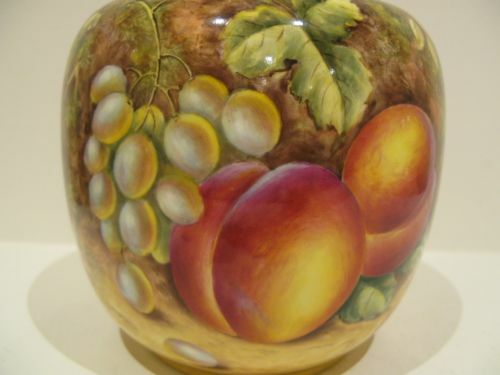 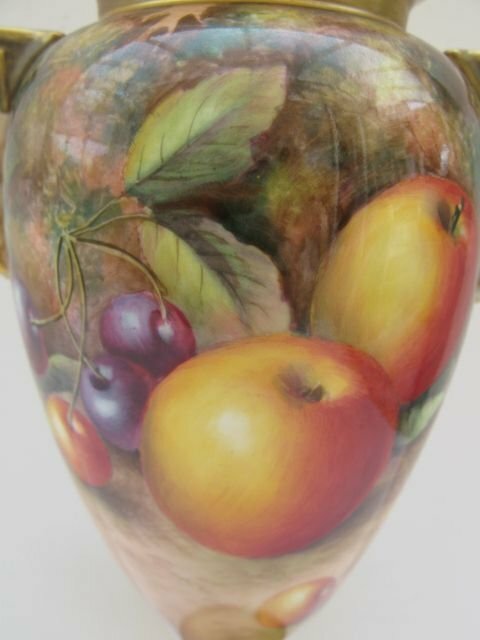 A Royal Worcester Fruit Painted Lidded Vase By D Shinnie. 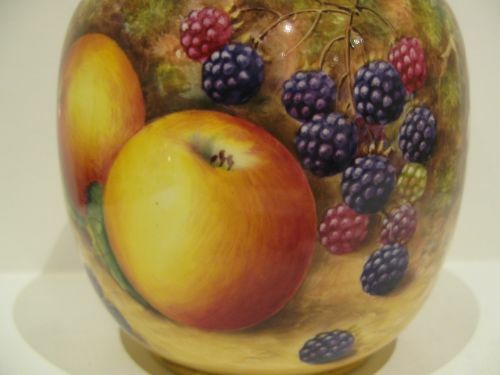 A Royal Worcester porcelain lidded vase, shape number 2701 large size, with all around fruit painted decoration by D. Shinnie. Standing approximately 8.1/4"overall height x 5.1/2"wide, it has the black factory stamp for the last quarter of the 20th century and is in excellent condition with no damage, crazing or restoration and the gilding is virtually unworn. 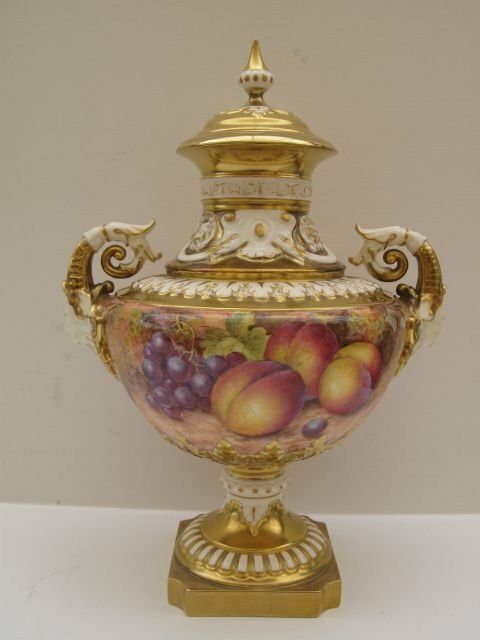 A Royal Worcester Fruit Painted Lidded Vase By E. Townsend. 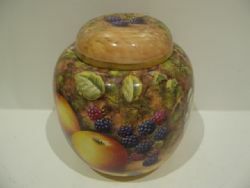 A small and attractive, Royal Worcester lidded vase of unusual hexagonal shape, with well painted fruit decoration by Edward Townsend. 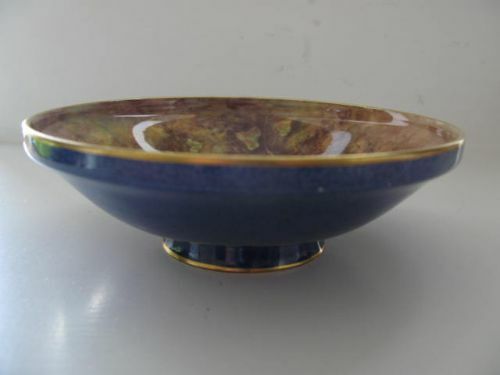 Standing approximately 4"overall height x 2"wide, it has the dark blue/green factory stamp for 1939 and is in very good condition with no damage or restoration and the gilding is fresh and without wear. 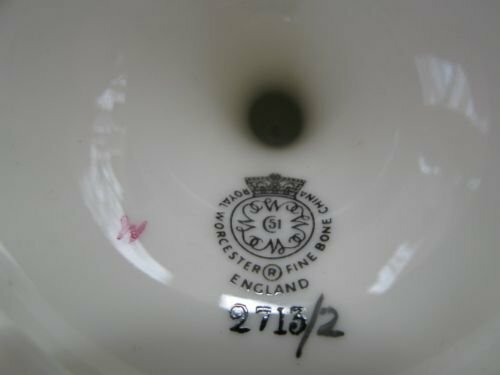 As can be seen in picture 5, there is a little light crazing to the underside of the base, but this is not visible without magnification. 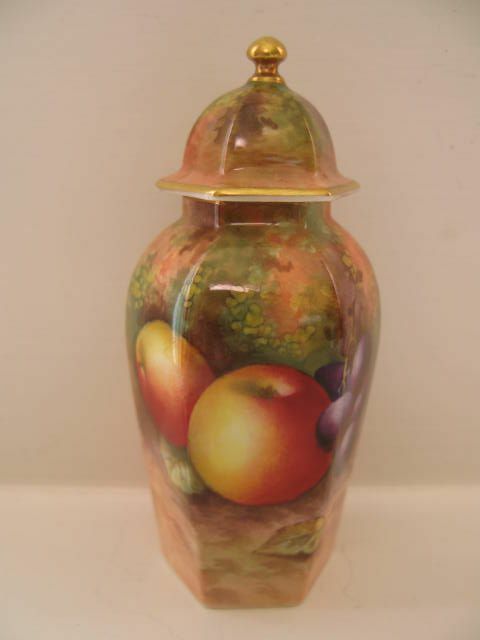 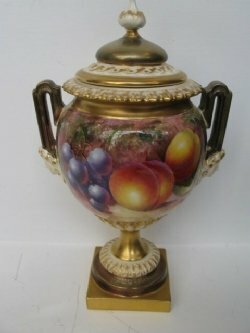 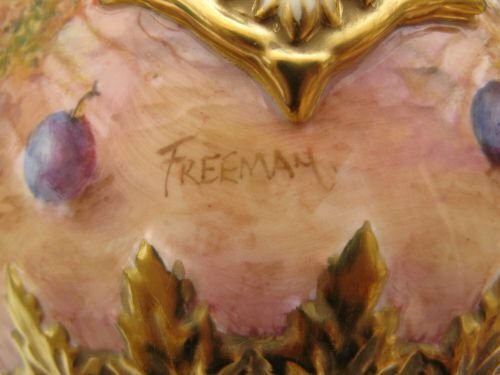 A Royal Worcester Fruit Painted Lidded Vase By Freeman. An impressive, Royal Worcester porcelain lidded vase, shape number 1572, with well painted all-around fruit decoration by John Freeman. 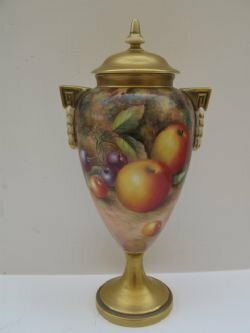 Standing approximately 11"tall to the tip of the finial x 7.1/2"wide over the handles, it has the black factory stamp for circa 1970 and is in very good condition with no damage, crazing or restoration, and the gilding is fresh and unworn, the only issue being that there is a small dark area in the gilding of the neck as shown in picture 3. 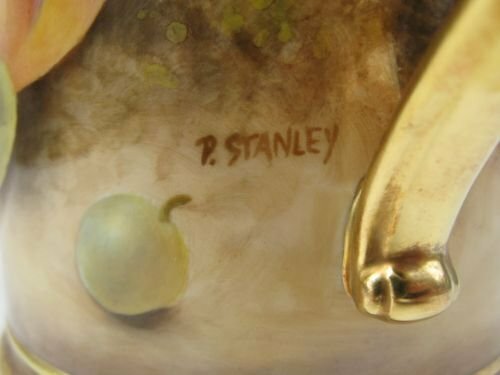 It measures 1/8"wide x 3/16"long and appears to be a small imperfection in the original gilding as it is totally smooth and undamaged. 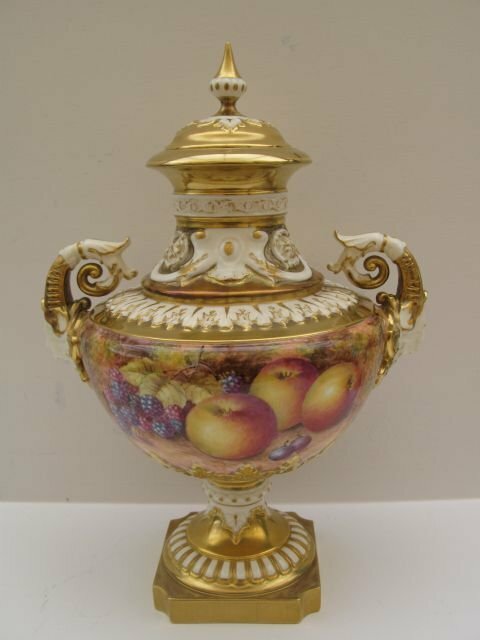 A Royal Worcester Fruit Painted Lidded Vase By Smith. 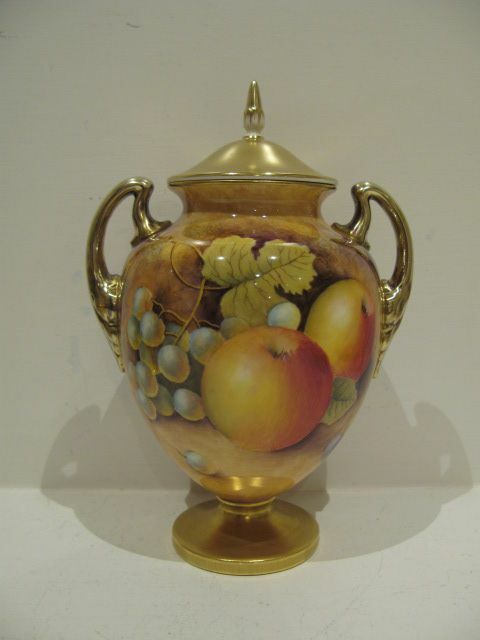 A Royal Worcester porcelain lidded vase, shape number 2713/2, with well painted fruit decoration by John Smith. 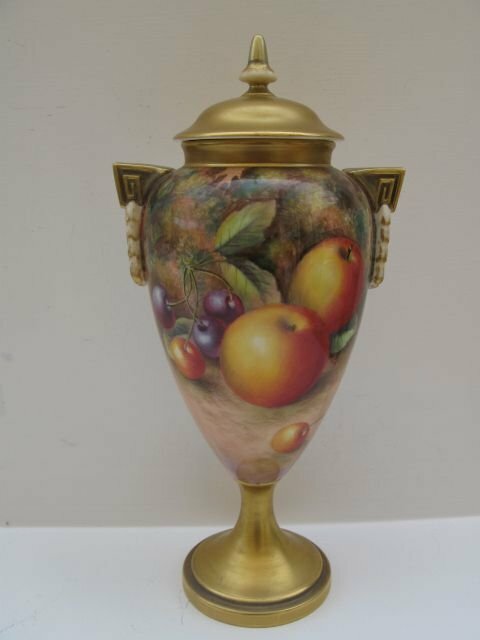 Standing approximately 10"tall x 4.3/4" wide over the handles, it has the black factory stamp for circa 1970 and is in very good condition with no damage, crazing or restoration, and the gilding is without rubbing or wear. A Royal Worcester Fruit Painted Lidded Vase. 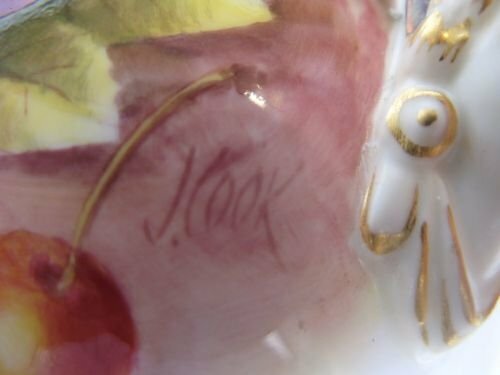 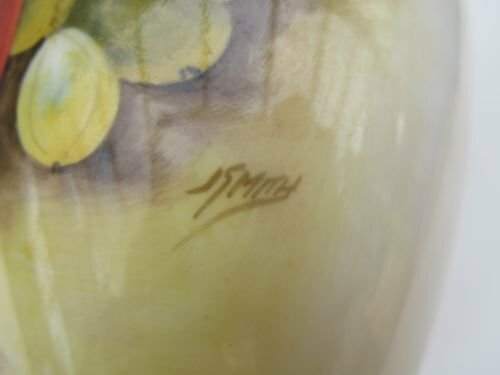 A good, Royal Worcester porcelain lidded vase, with hand painted fruit decoration by John Cook. 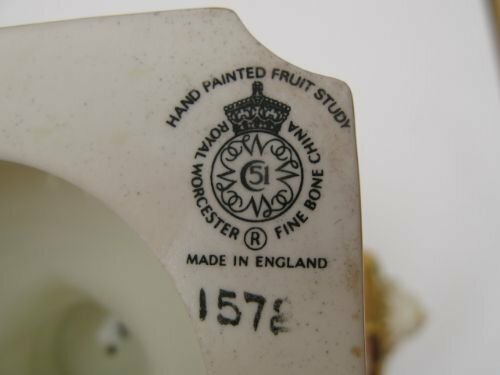 With black factory stamp for 1963, it stands approximately 8.5" overall height, and is in excellent condition with no wear to the gilding, damage or restoration. A Royal Worcester Fruit Painted Miniature Coffee Pot By P. Platt. 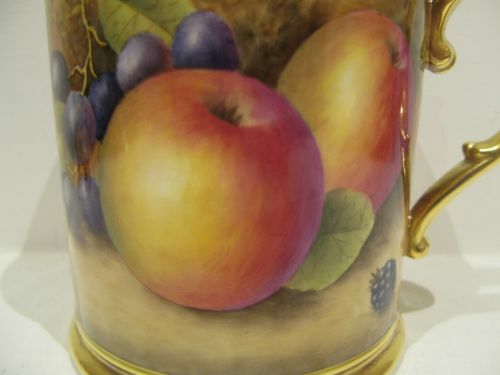 A good Royal Worcester porcelain miniature coffee pot, with very nicely painted apples, black grapes and brambles against a mossy background by Peter Platt. 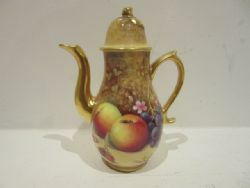 Standing approximately 4.3/4"overall height x 3.1/2"wide over the spout and handle, it has the black factory stamp and was bought from the Royal Worcester factory shop in 1994, since when It has spent all its life behind glass in a display cabinet and is therefore in excellent condition, virtually as good as the day it left the factory.